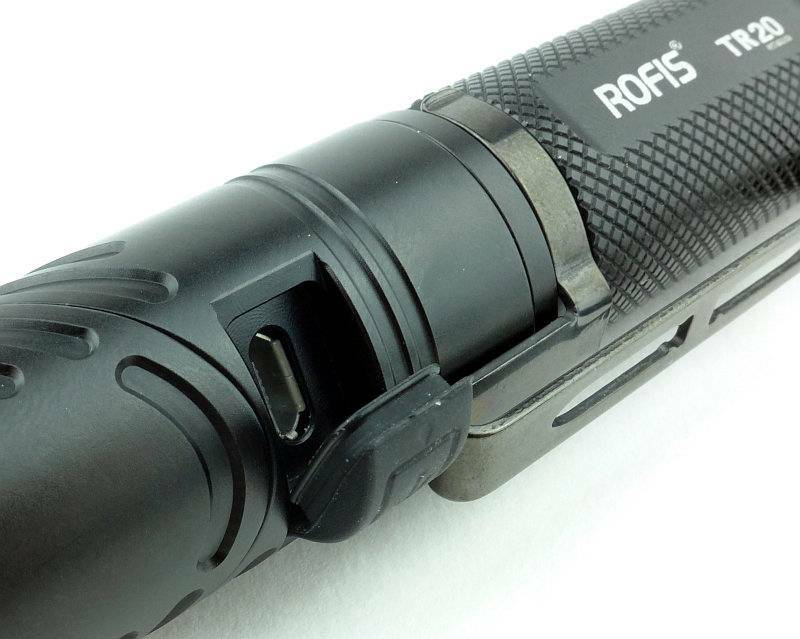 Rofis were the first manufacturer I came across which have made a standard tubular light that transforms into a right-angle light. 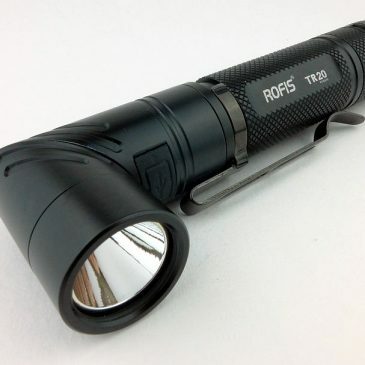 They have applied the same principle to a couple of different models, and in this review we are looking at the TR20, which is an 18650 powered model with built in USB charging, making it an all-in-one lighting solution. 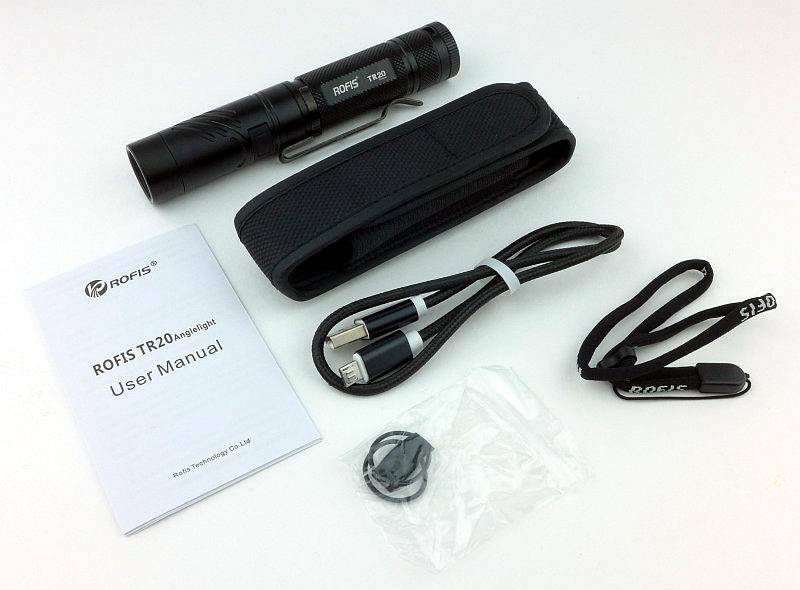 Included in the box is the TR20 (with 3400mAh cell inside), holster, USB cable, wrist lanyard, two o-rings, a spare USB port cover and the instructions. The UBS cable is of a nice quality with metal plugs and a braided cable. On the holster there is an apparently overly long patch of Velcro, but we shall see about that later. 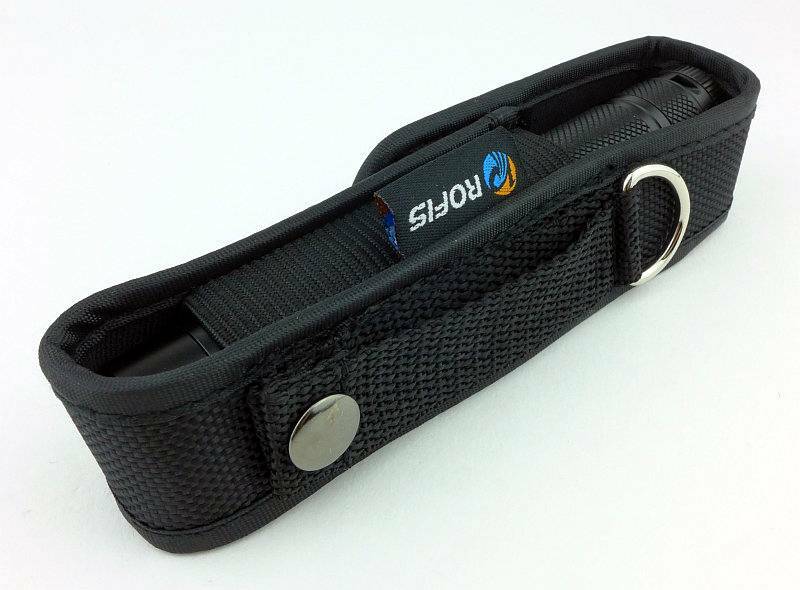 There are three loops on the holster, a D-ring, a fixed belt loop and a loop secured with a press-stud. And here we have the TR20 in its ‘normal’ tubular configuration. Switching round for a different view. Fitted to the TR20 is a long steel pocket clip. 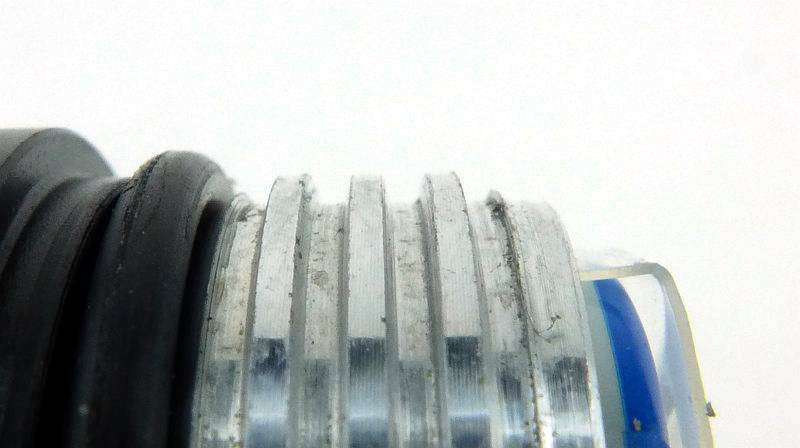 The tail-cap has a plain appearance, but the very end looks slightly different. 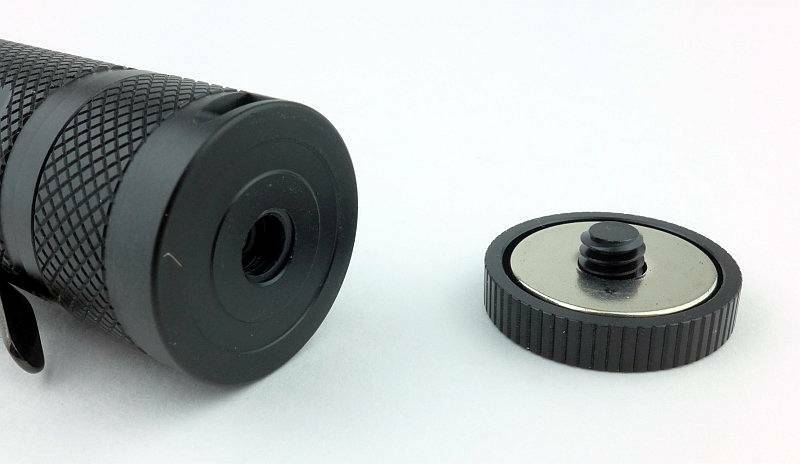 The explanation for the way the tail-cap looks is that screwed onto the end is a removable magnet. 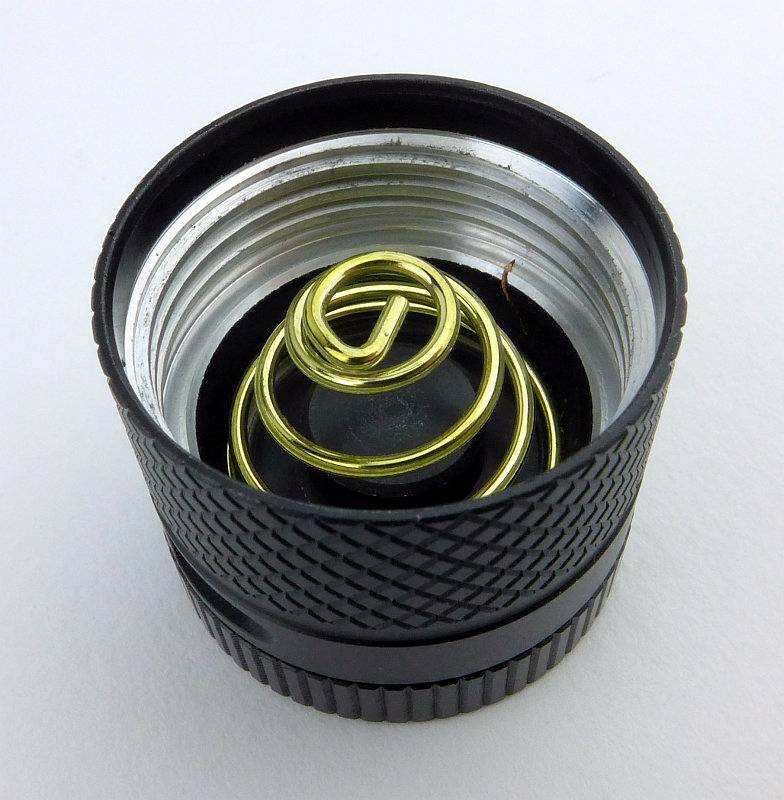 Inside the tail-cap there is a gold plated spring contact. Bare threads mean there is no physical lock-out. 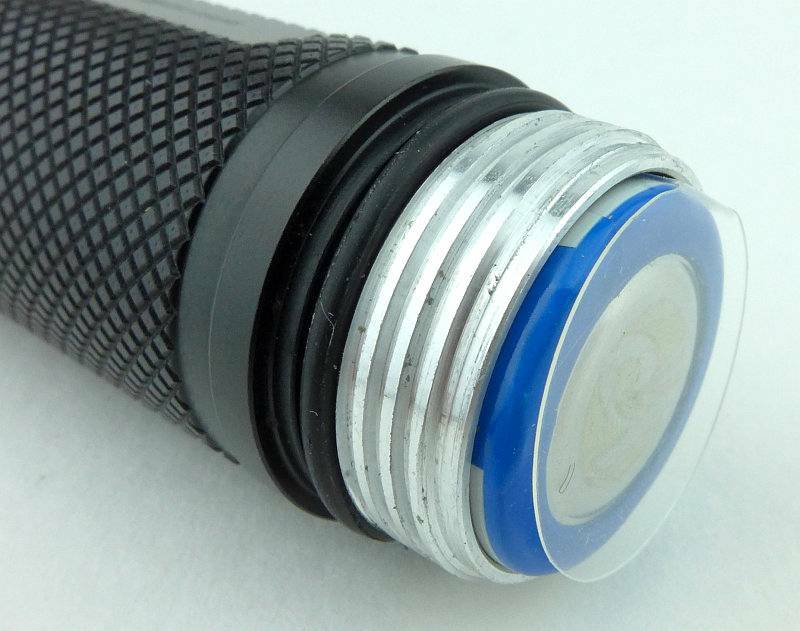 As the TR20 ships with the 18650 inside, it comes with an insulator which you need to remove. Square cut threads are used for the tail-cap. 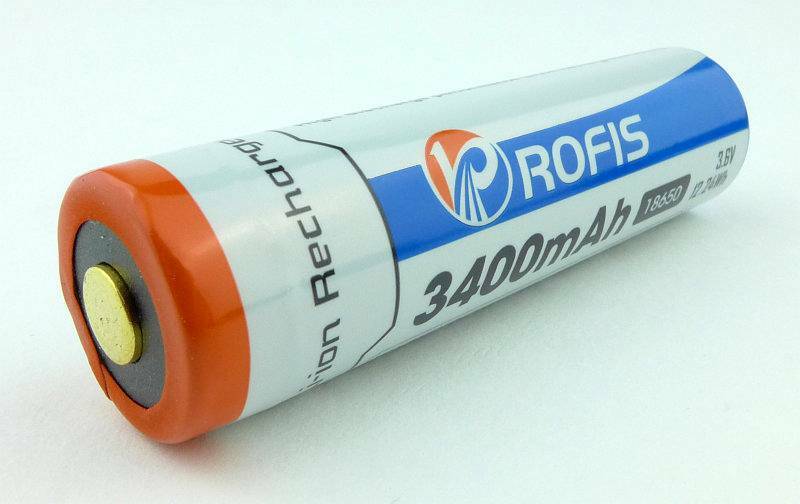 It is a Rofis branded cell that is included. An unnecessary detail, but a nice touch is that the negative terminal has the Rofis logo etched into it. The positive terminal is gold plated. Opposite the control switches is the rubber USB port cover. Using your nail, you prise the hinged cover out. 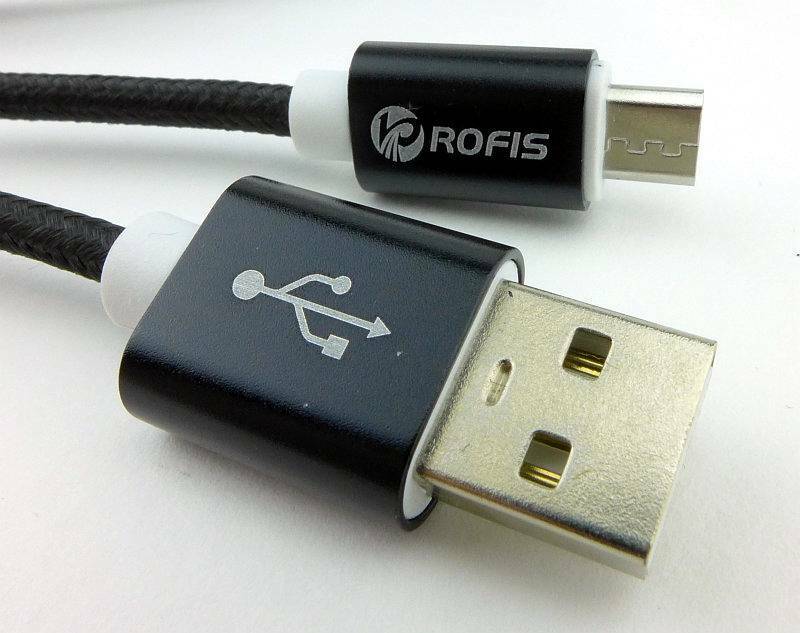 Here the supplied USB cable has been plugged in for charging. While charging, the red indicator light in the dual switch is on. Once charged this will go green. Also note the dual switch where the front part is the mode change switch and the rear part is the power switch. The smooth reflector does have a few visible machining marks in it, but these don’t aversely affect the beam. 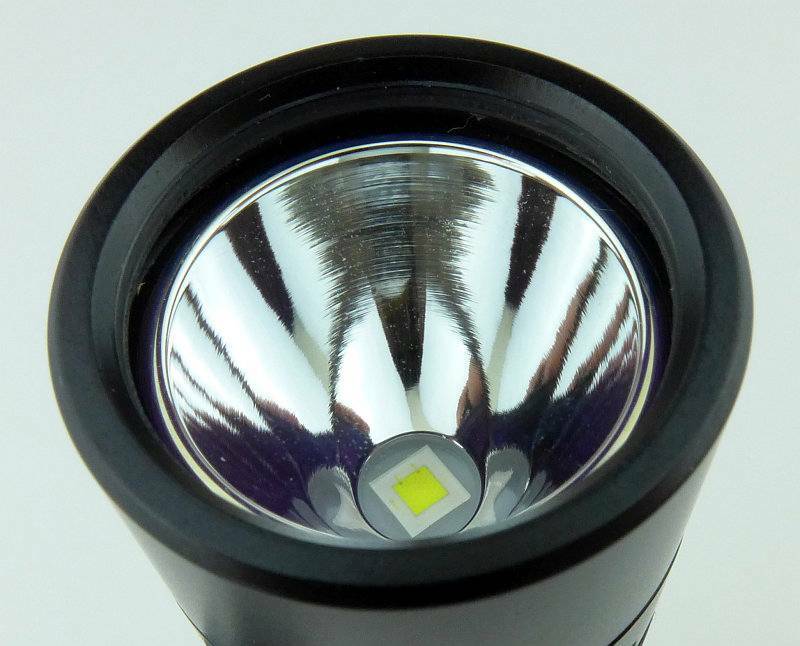 A XP-L Hi V3 LED is used. So, the reason for the extended Velcro area on the holster is so that when the TR20 is transformed into a right-angle light the flap folds over further and still fits the TR20 perfectly with the lens sticking out sideways. 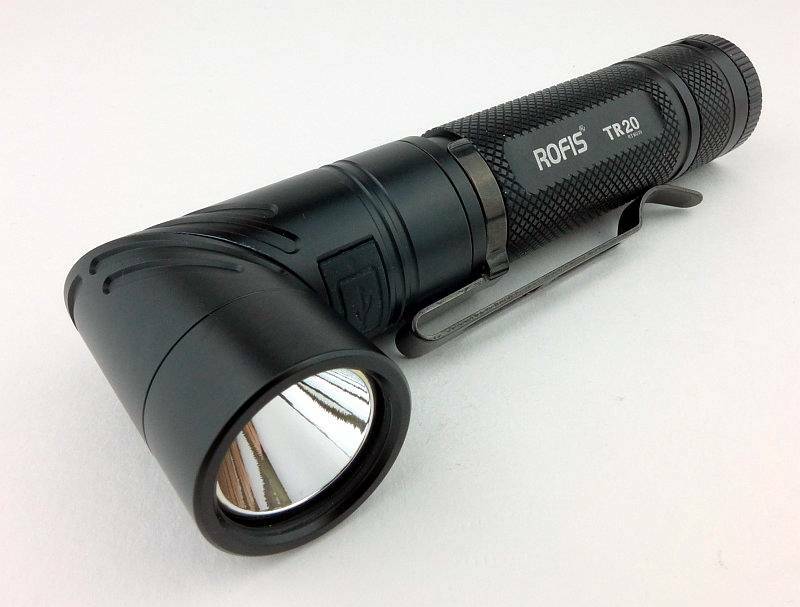 Starting indoors, the TR20 does have a bright hot spot, but the transition to the spill is smooth and the spill is sufficiently bright that the beam does not appear unbalanced. Moving outdoors you can see how the spill is nice a bright and gives a good view. 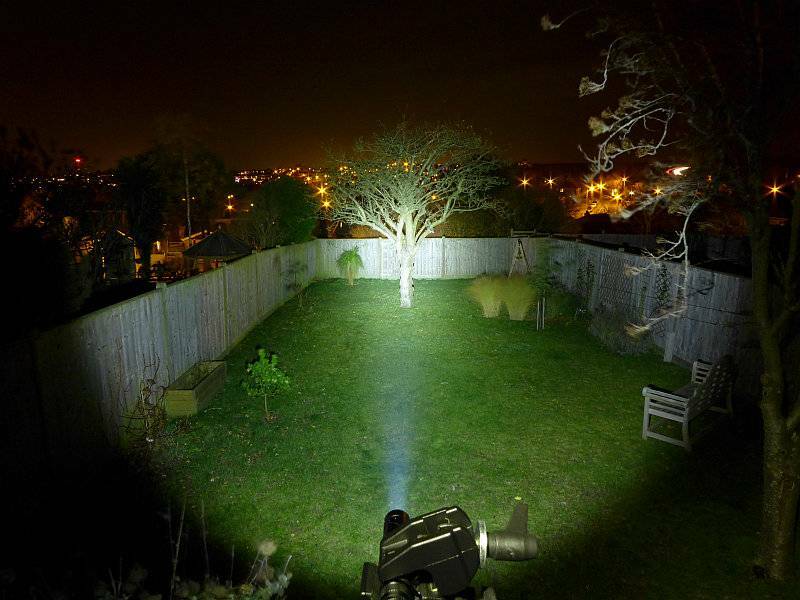 Though not a flood beam, the beam has a good useful width. 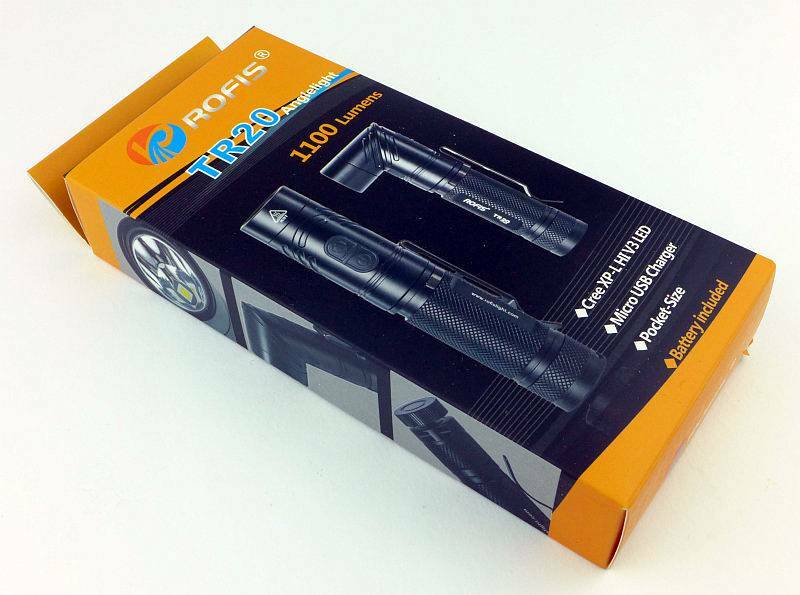 The TR20 has 6 constant output modes (Turbo, High, Mid, Low, Lower and Ultra-Low) and three flashing modes (Strobe/Beacon/SOS) controlled by a dual button. From OFF, to switch ON to the last used constant output (not including directly accessed modes), briefly press the Power switch. When ON, press the Mode switch to cycle through Turbo -> Ultra-Low -> Low -> Mid -> High back to Turbo etc. To switch OFF briefly press the Power switch. From OFF, for direct access to Turbo, press and hold the Power switch for more than 1s. From OFF, for direct access to Ultra-Low, press and hold the Mode switch for more than 1s. To access flashing modes, from ON, press and hold the Mode switch for more than 1s. This will activate strobe. Press and hold the Mode switch for more than 1s again to switch to Beacon mode. Press and hold the Mode switch for more than 1s once more to activate SOS. 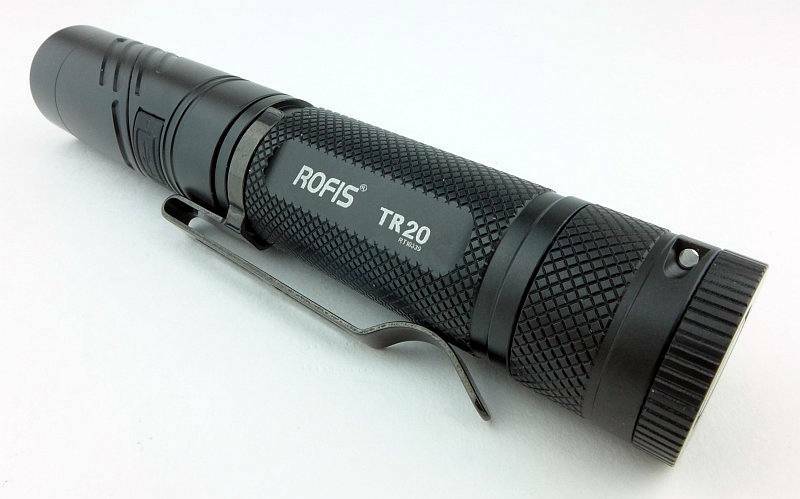 Once activated, pressing the mode switch briefly returns the TR20 to the previous steady mode, or a brief press of the Power switch will turn the TR20 OFF. 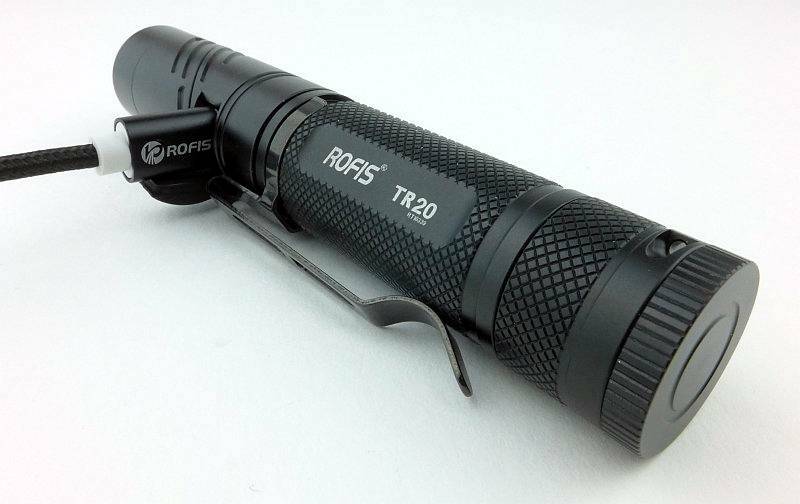 The TR20 is Strobe-Ready and to activate Strobe directly from OFF, double-click the mode switch. There is a lockout mode included. With the TR20 OFF, press and hold both buttons simultaneously for 3s to enter lockout. 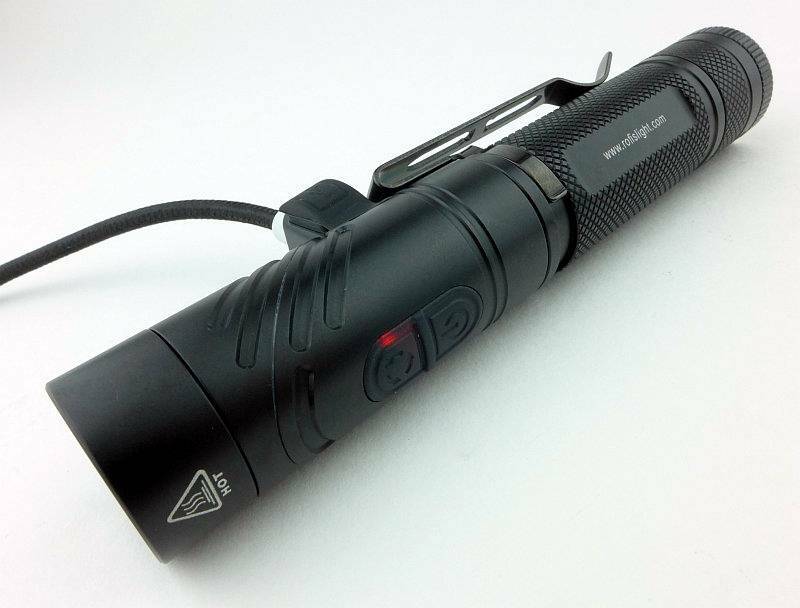 When entering Lockout, the TR20’s red indicator light in the dual switch will come on to indicate Lockout has been activated. Like this the buttons will not turn the TR20 on. To exit Lockout press and hold both buttons simultaneously for 3s and the TR20 will turn ON in Low mode. 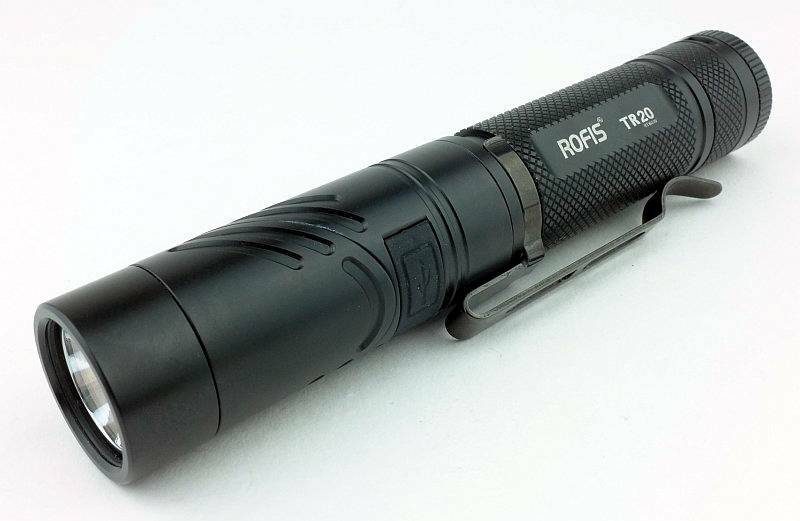 Lastly when turning the TR20 ON, or changing mode, after 3s the dual power switch will light up to indicate the remaining battery power. This will light green if there is more than 50% battery left, red if there is less than 50% and will flash red if the battery is low. 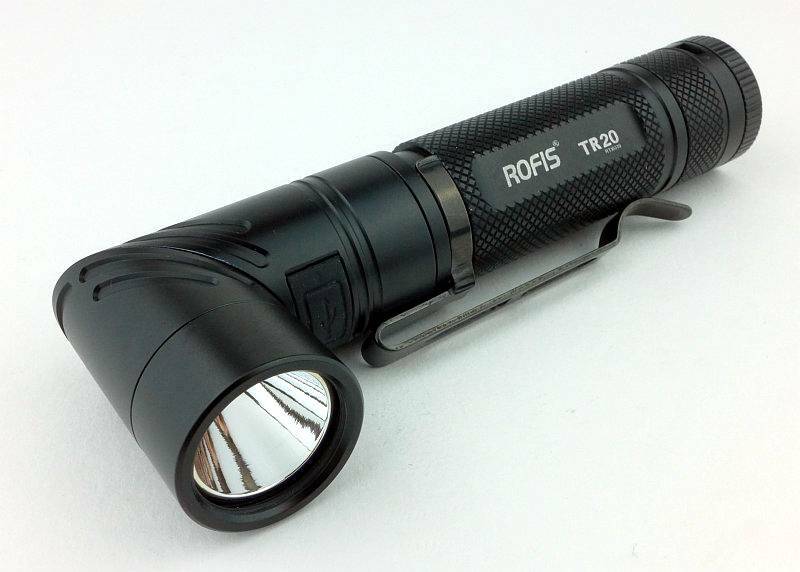 The TR20 runs on a standard 18650 which is supplied. Peak Beam intensity measured 15600 lx @1m giving a beam range of 250 m.
There is parasitic drain at 83.8uA. 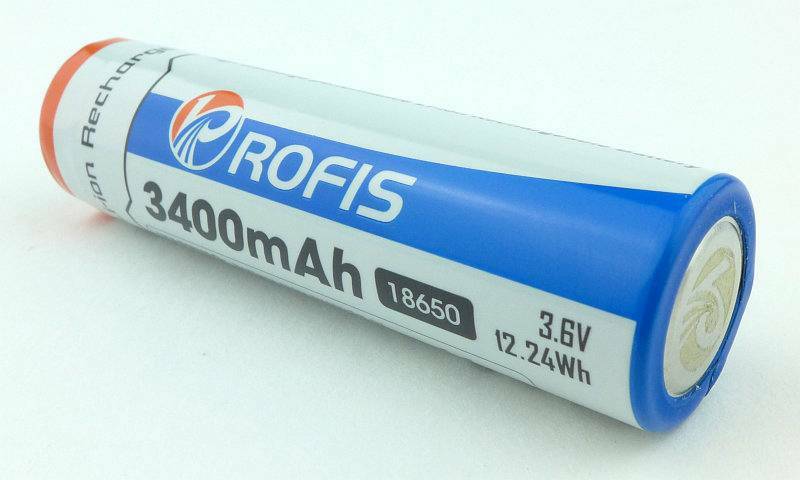 When using a 3400mAh cell it will take 4.63 years to drain the cell. At switch-on the near 900lm output is short lived and after only around 30s starts to decline to the 750 running output. There are some unexplained dips around the 15 minute mark where the output briefly drops to 560lm but then goes back up to 750lm again. 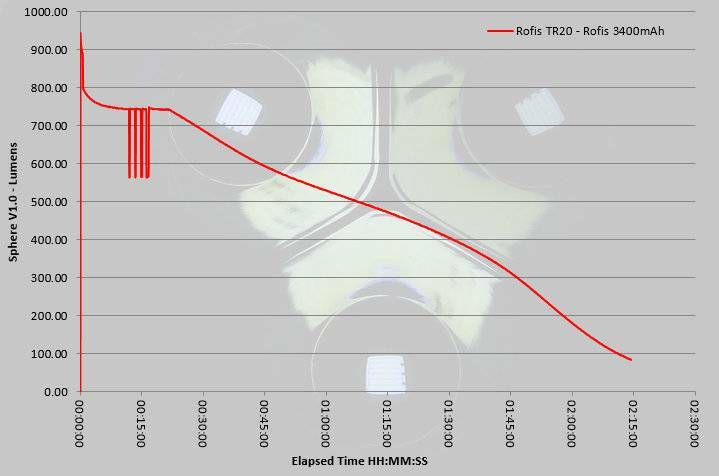 After 20 minutes from switch-on the TR20 no longer maintains regulation and the output starts a steady decline until the end of the ANSI runtime at 2h 15m. 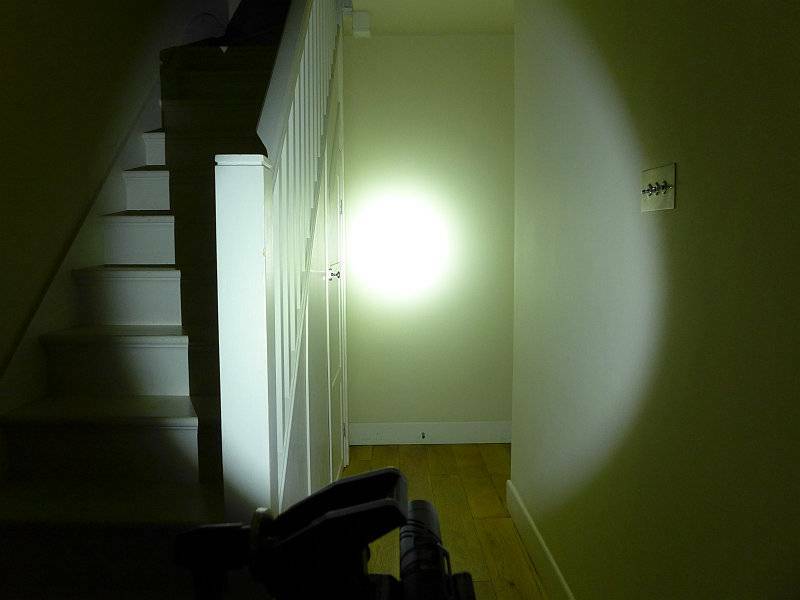 Right-angle lights are incredibly useful and bring an added dimension to the function of a light. 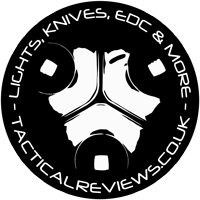 Personally I find the variety of grip options they bring make them amongst the most comfortable to use, with a natural pointing of the beam as well as allowing various arm and hand positions that still direct the beam forward where you want it. 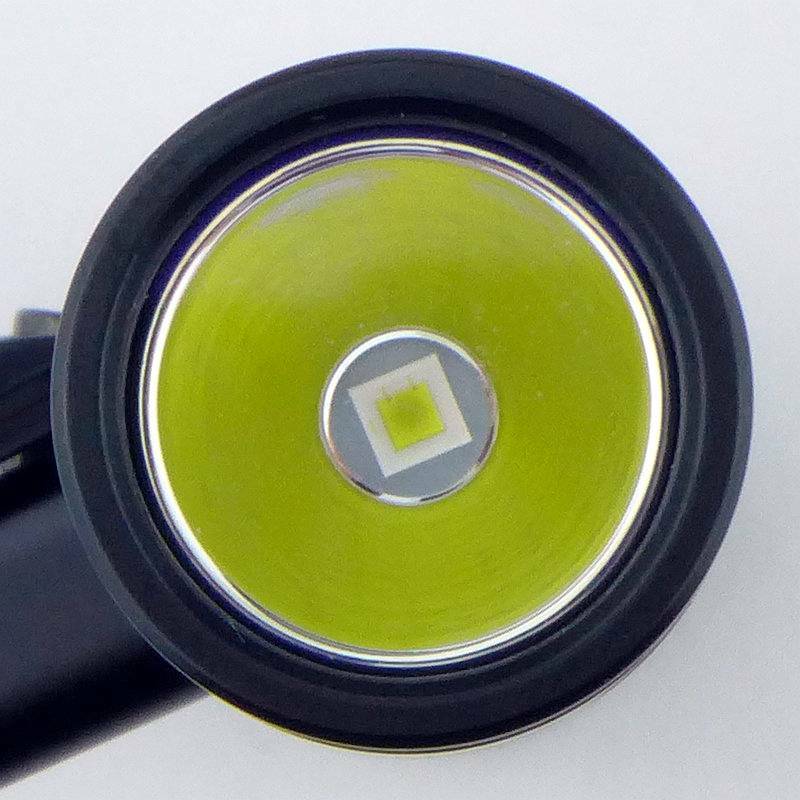 If I had to choose between a straight or right-angle light it would be a right-angle that I would choose, but there is a definitely a place for the straight tube light. Why have to choose one or the other when you can have both? Having a dual-switch does make the UI very functional, but these types of switches don’t work so well when using gloves as you can’t feel the two parts of the switch. For gloved hands the two switch parts are a bit small so you can miss the part you meant to press. 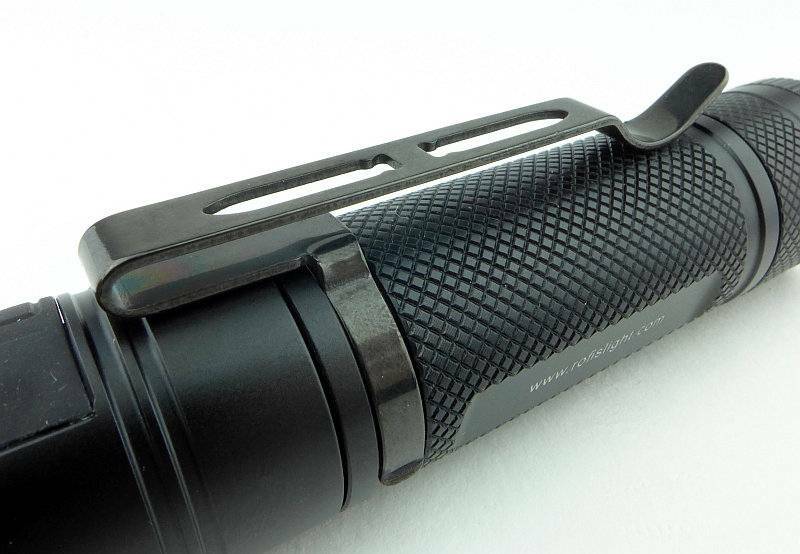 Gloved use may not be the highest priority because this light is not a tactical light, it is a utility light. 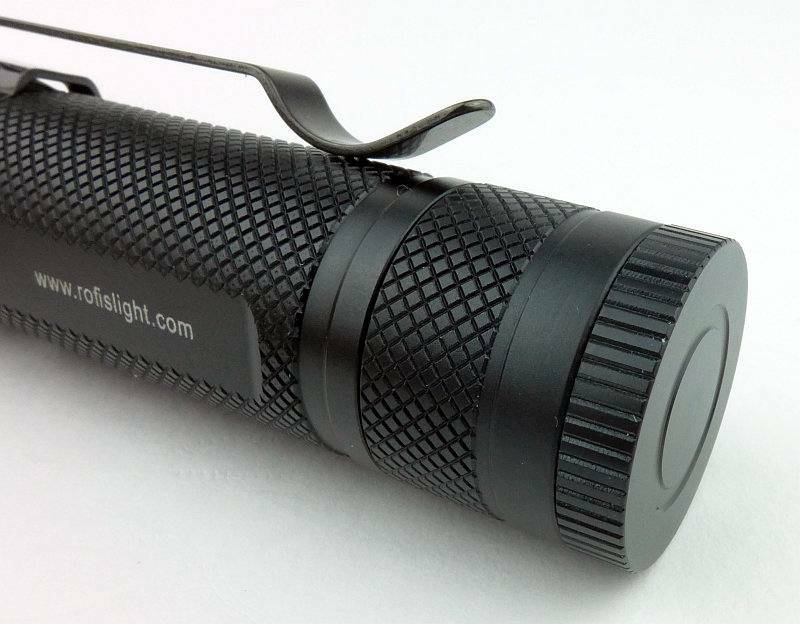 Another example of how functional this light is, is the holster that adjusts to the straight or right-angle configurations. But there is more. When in the right-angle configuration, the control buttons now line up with the gap on the side of the holster opposite the lens. In this way you can operate the TR20 when it is still in the holster giving you easy access and hands free use; this is the real benefit. 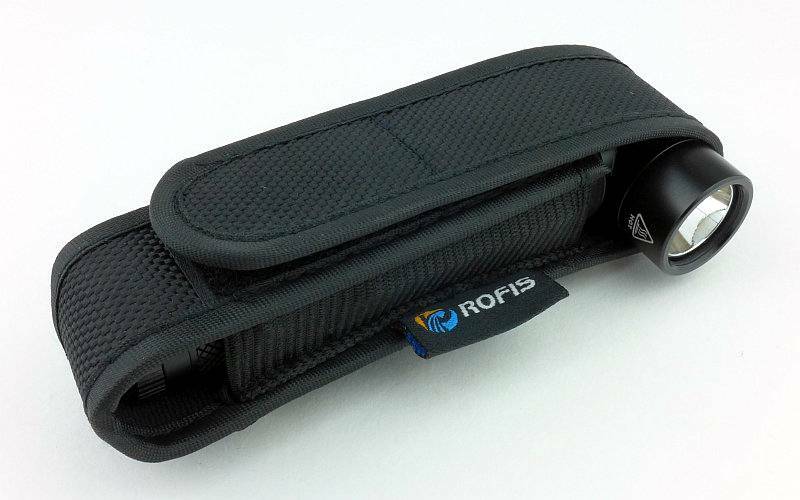 USB charging and the use of a standard 18650 cell adds convenience and ease of carrying a spare cell. The power indicator which tells you ‘Over 50%’, ‘Under 50%’ and ‘Empty’ is better than nothing, but might tend to lead you to keep topping up once you hit ‘Under 50%’. At least you only need to flip the USB port cover aide and hook it up to your USB charger. One aspect that very much surprised me, and it is one I’ve heard others have found, is that the rotation of the head to transform to and from the right-angle configuration is very stiff. I’m known for a pretty strong grip and am the person at the archery club who is asked to pull out the arrows others can’t. I say this as I feel that if I find this too stiff, I think there are plenty of people who would struggle with it. Clearly you don’t want the head swing back round to straight, and this certainly won’t, but you do want to be able to transform it easily. Another way to look at it though, is that any concerns that the articulation of the head might introduce a weakness certainly doesn’t seem to be the case. The instructions say that the last used output mode is memorised, but doesn’t mention that this does not include a mode activated by the direct access option. Only the mode set when the TR20 is on and the mode switch pressed to choose the level is memorised. As I typically use the Ultra-Low level, this is the reason I’ve become aware of this. To be sure you get the lowest level you will need to use the direct access method for Ultra-Low rather than relying on the ‘last used’ mode. This behaviour is good as you end up with direct access to one additional mode; if you have memorised medium, but have used the direct access to get ultra-low, simply switching it off and on again gets you back to medium. Magnetised lights leave me in two minds; I find them more annoying than useful as they stick to everything I didn’t want them to, the TR20 completely removes this annoyance by making it very easy to remove the magnet, and not only that, but the threaded hole left where the magnet was will fit onto a tripod. A quick observation about the lockout mode; As the only indication you have entered lockout is a flash of the red indicator in the dual switch, when you are pressing both parts of the dual switch, your fingers mostly hide the red light. It would be easier to see if the main LED was given a brief flash to let you know it was going into lockout. Pocket clips are normally something I strip off straight away, largely because they are often too stiff and damage the pocket. Rofis have got this clip spot on. It is long and stable, yet the spring force is low enough not to be harsh and damaging. 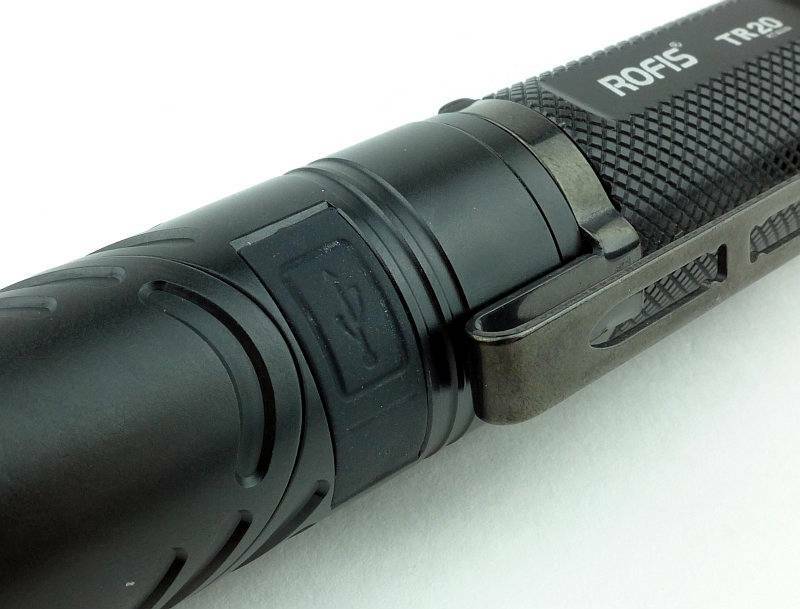 Add to this the right-angle configuration and the pocket clip is much more practical than on many lights. Overall, the ability to transform the light into two different configurations overrides any minor quibbles with this light and makes it very attractive and very useful. Transforms from a straight to right-angled configuration. Head is very stiff. Direct access to Turbo, Ultra-low and Strobe. Dual button is difficult to use with gloves. Removable Magnet. Lockout indication not clear. 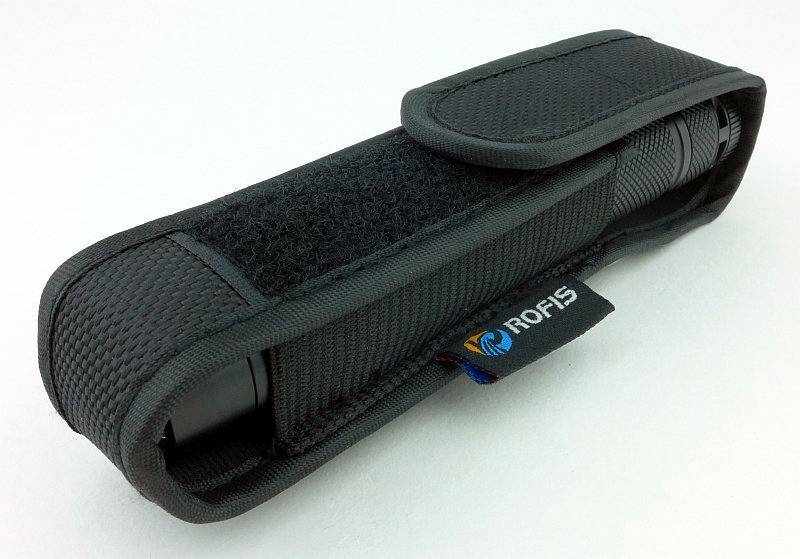 Holster adjusts to straight or right-angle configuration.